The MS family of remote controls is based on the Linx MS Series encoder and decoder. The MS Series uses a random fixed address with 224 possible combinations to give a high level of uniqueness and a reasonable level of security. The address is created by the user with the press of a single button, eliminating the need for large DIP switches. The MS Series also provide a wide range of innovative features including the ability to establish user groups and button level permissions. Ease of use and security are dramatically enhanced by the on-board MS Series encoder, which allows instant creation of up to 16,777,216 (224) unique addresses without cumbersome DIP switches or cut traces. The MS Compact Handheld transmitter is ideal for general-purpose remote control and command applications requiring a small form factor transmitter. The small transmitter has a line of sight range of up to 750 feet (230 m) when combined with an LR Series receiver and MS Series decoder. 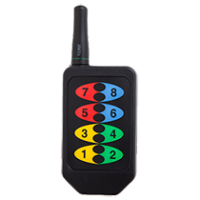 As part of our MS family of wireless remote controls, it is available in 315, 418 (standard) and 433.92MHz. It has been pre-certified for FCC Part 15, Industry Canada and European CE (433MHz only) compliance, reducing costs and time to market. The MS Long-Range Handheld transmitter is ideal for general-purpose remote control and command applications that require longer transmission distances. The small transmitter has a line of sight range of up to 1,000 feet (300m) when combined with an LR Series receiver and MS Series decoder. 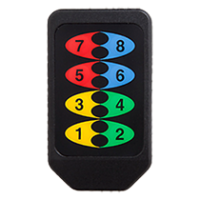 As a part of our MS family of wireless remote controls, it is available in 315, 418 (standard), and 433.92MHz. It has been pre-certified for FCC Part 15, Industry Canada and European CE (433MHz only) compliance, reducing costs and time to market. 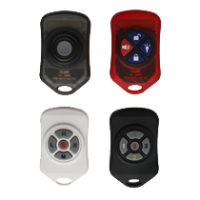 Trigger discrete actions with button presses by using the MS keyfob transmitter with a compatible receiver and MS Series decoder. The MS Series provides a medium level of security. It lets you send commands from multiple transmitters to distinct receivers in the same vicinity through digital addressing. The remote contains an MS Series encoder and an LR Series transmitter. It can be used with a combination of an MT Series transcoder or MS Series decoder and an LT Series or LR Series RF module.